June 14, 1850, Owen Broshears, William Estill and John McTarsney platted the town of Centerville. This area is located between North Main Street and the Railroad and between Kerton and Owen Streets. There were 32 lots on the east side of the railroad and one on the west side for the Jeffersonville Railroad Depot. The oldest house standing in Scottsburgh in 1995 was in Centerville. It is on the southeast corner of High Street at the Railroad and supposedly this was the stagecoach stop. Centerville was not a growing community. The platting of Scottsburgh was recorded on March 27, 1871 by Henry K. Wardell and William Estill. The town was named for Colonel Horace Scott, a popular general superintendent of the Jeffersonville, Madison and Indianapolis Railroad. First town board organized July 22, 1884 consisting of W. H. Shanks, Jacob Shapinsky and Levi N. Ervin. Henry Brodt was Town Clerk and Marcellius Davis was the Town Marshall. Scottsburgh’s first Fair was in 1888 and located on North Main Street on the east side just north of Owen Street. Early Scottsburg was spelled Scottsburgh until June 30, 1892 when the post office changed to Scottsburg. State Highway #1 was named in 1900 and consisted of North Main Street to Vienna. Roads also ran from Salem to Madison and Blocher. Telephone service began in 1906. November 3, 1959 the eligible voters of the town of Scottsburg expressed their opinion on ballot that the town should be a city of the Fifth Class. A special election was held to choose the first officers of the new city, and the victorious candidates were sworn in on January 1, 1964. The first mayor, Blake Burns took office at that time. Other officers were: Zelma E. Gladden, City Clerk-Treasurer; Richard E. Hosea, Councilman-At-Large, Third District; John B. Hards, Councilman-At-Large, Fourth District; George E. Johnson, Councilman-At-Large, Fifth District; L. Ralph East, Councilman-At-Large; and Donald C. Hayes, Councilman-At-Large, Second District. The list of Mayors are Blake Burns, 1964-1967, 1972-1975, 1976-1979; Jim Campbell, 1968-1971; Zelma Gladden, 1980-1983; Bill Cranford, President of the City Council, served as Acting Mayor September 30, 1983 to November 9, 1983 due the the resignation of Zelma Gladden; Ed Cozart began his duties as of November 9, 1983, served 1984-1987 and Bill Graham has been serving since 1988 to the present (2010). The City Hall is located at 2 East McClain Avenue. 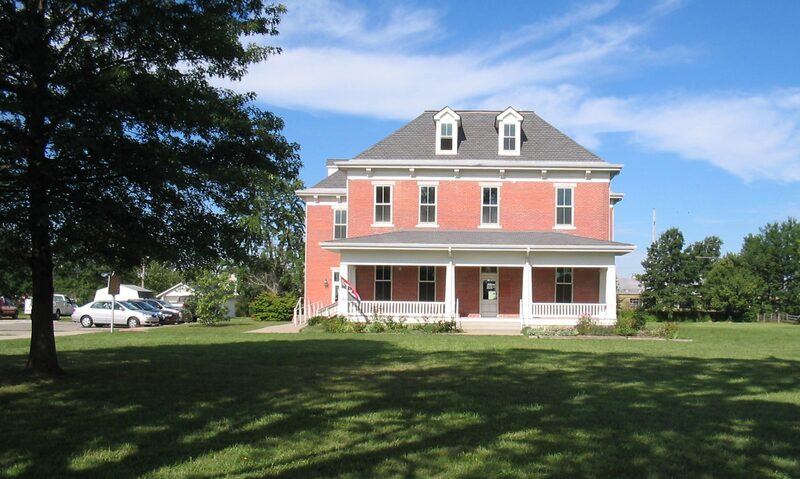 More information on Scottsburg can be found in the Scott County Public Library, Scottsburg that includes the Scottsburg Heritage Buildings that was compiled and donated by the Scott County Historical Society. Last Friday afternoon a thief entered the residence of Charlie A. Manker, while the family were absent, by prying off a window sutter and stole about $53 in money. On the same night, two masked men entered the residence of Willis Davis (Mr. Davis was at the time in Ky.) and pointing a revolver at Mrs. D. and with threatening oaths complelled her to “fork over” her money, which amounted to about $25. The robbers told Mrs. D. that they would return and cut her throat if she attempted to give the alarm before daylight. This makes three robberies committed in our quiet little village quite recently. Judge Trulock was robbed of $40 a few days ago. Our clever postmaster has provided himself with a new cabinet of rent boxes. Quite a number of the Scottsburgh folks attended the basket meeting at Goshen last Sunday. Alonzo L. Alpha, the well known merchant and cabinet maker, of Vienna, died very suddenly on last Monday morning. Mr. A. was an old pioneer of the county, he was highly esteemed by all who knew him, was kind and benevolent to all. His death is not only a loss to his family but to the entire community. Alfred Jones and Sarah I. Cornish; robert H. Freeman and Lillie Gelles. Mr. Goben has donated copies of the book to the Scott County Museum and they are available for $5.00 each. There are several maps and illustrations of Native American tools. If you are interested in a copy, please contact the Museum, museum@c3bb.com or telephone 812.752.1050. During the author’s research of the “Old Lake” area, it was his good fortune to become acquainted with Mr. Claude St. Clair, who lived on what was the north shore of the lake and camp site 3 which is located on his farm. During a conversation with him, he told me that as a boy of 10 years he remembers watching workmen off load a large steam dredge from wagons and floating it on Stucker Fork Creek upstream from the bridge at the Merle Turley farm on State Road 203. This was in about 1913 to his best recollection. He stated that the workmen dredged the creek westward in a straight line from that upstream site and he watched as other workmen moved the 203 bridge with teams of oxen and horses and pulleys to its present location. The bridge since rebuilt was a wooden structure at that time. He further stated, that he remembers watching the workmen fire the steam boiler on the dredge with fire wood cut from the trees growing on the old stream banks. He stated that he believes that they finished dredging in about 1919 beyond the Thomas Town bottoms. August 9, 1992, a 9” rain began to fall over the area of “Old Lake” and in less than 7 hours the lake became alive again. Mr. and Mrs. Goben drove north on U.S. 31 from Scottsburg to their farm to check for damage and at that time there was about 4 inches of water over the highway just north of town. About one hour later on their return trip there was about 10 inches of water and we were the last vehicle through before the highway was closed. A check of the water level revealed that about 7 feet of water covered that spot, where the oldest recollection of people was that they had never seen U.S. 31 flooded before, at that point. A flight by news reporters and their film footage revealed that “Old Lake” was back to its old elevation of 550 feet and did millions of dollars of damage over a wide area, to homes, businesses, public works and farms. Married — At the Wilson House in Lexington, Monday evening by Charlie A. Manker, Mr. William L. Harloo and Miss Belle Snow. Oscar Perregrine and Avarilla Peacock; Thomas A. Gillispie and Ellen Tipps; John W. Langdon and Mary E. Long; William L. Harloo and Belle Snow; George W. Ramsey and Cyntha A. Hocum; William T. Perin and Mollie A. Crum. A 15 months old daughter of Jno. Shearer, died yesterday at the residence of A. L. Gladden. A small child of James M. Craig, Jr., and wife, residing near Marshfield, died last Saturday. An infant child of Geo. Hazzard and wife, died at Geo. M. Johnson’s residence in this place, one day last week. Another infant daughter of Hi Anderson and wife, died Sunday, of brain fever. Marriage License — J.N. Smith and Cordelia Cravens; David Gray and Mrs. Elizabeth Jones; James V. Clapp and Alice Eldridge. The Jury commissioners last Monday drew the following named persons for Grand and petit jurors for the October Term of Circuit Court: Grand Jurors: Melvin Hubbard, John F. Richey, Frederick McKneely, Daniel P. Boles, James McClain, and Jas. H. Wilson. Petit Jurors: John W. Tull, Trevanian Boyd, V. B. Hardy, Cyrus Mace, Enj. Spurgeon; Jno S. Swope; David C. Wir; Jno. H. Finley; Geo. W. Everhart; Jno. Kennedy; Jacob Miller; and Wiley Rickard. Only one marriage license has been issued since last report: Wm. N. Hopper and Sarah A. Ridge. Marriage License: James H. Grapevine and Nancy Ellen Chandler; Jesse O. Cooley and Mary E. Nickles; William T. Boatman and Victoria C. Schmitz. Died — Mrs. Elizabeth Salmon breathed her last at the residence of A. L. Gladden, last Saturday night. She had been suffering for several months with consumption. Married — By Elder C. A. Manker, at the Clerk’s office yesterday morning, Mr. Davis of Washington county, and Miss Mollie Dean of Finley township. Marriage License — Since last report the following have been issued: James A. Davis and margarette E. Wells; Joseph Denton and Mary A. Nixon; and Samuel S. Snow and Azora A. Mercer.